Is the Layer Marney Tower Haunted? The Layer Marney tower boasts the tallest example of a Tudor architecture gatehouse in Britain. Constructed in the later part of the reign of king Henry VIII, the building was the creation of Henry the 1st lord of Marney, though he died during its construction, passing responsibility onto his son John in 1523, though he also died just 2 years later. Since there were no male heirs left in the family to continue construction the designs changed from the original plans and the end result contained 300 foot long main range, various out-buildings and a church, as well as the iconic 80 Ft tall gatehouse the property is most well known for. The property has changed hands various times in its life but came into the hands of the present owners, the Charrington family, in 1959. In 2012 the Charrington's opened the tower and gardens to the public and also hosts various functions such as weddings and business conferences. The whole property is listed by English Heritage as a grade 2 listed building and is also on the register of parks and gardens of special historical interest in England. 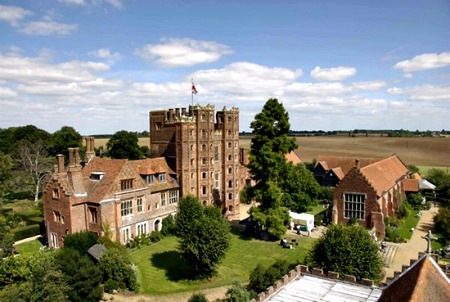 Is Layer Marney Tower Haunted? The most well known ghost at Layer Marney tower is thought to be of Lord Marney himself who is said to haunt here because he is unhappy with how to building was finished, since he died before it was finished and his son was not able to complete it to the original designs since he died just 2 years after his father. He has been most often seen climbing the staircase of the tower wearing a full suit of armour, as well as claims of him being seen riding a horse within the towers gardens. Various apparitions have been seen throughout the tower and its grounds, but the odd thing about the spirits seen is that they all seem to be dressed in Victorian clothing, with the odd thing about this being that the building dates back to Tudor times. Most of these spirits seem to be that of servants and general lower class workers, but who any of these spirits are or why they linger here will forever remain a mystery. The east wing is said to be a hotspot for paranormal goings on, mostly in the form of poltergeist activity. People have claimed to have seen objects move right in front of them or even be violently thrown across the room. Claims of being touched in this area by unseen hands are also something which seems to be often reported, with the feeling of someone placing a hand upon a guests shoulder, or the gentle stroking of female visitors hair. The gardens are known to be just as haunted as the tower, with sightings of a woman dressed in a fine Victorian gown and the ghostly apparition of what appears to be one of the grounds past gardeners.